Prince-Tyson Gulley had two touchdowns on the ground and one receiving as Syracuse pounded West Virginia, 38-14, in the New Era Pinstripe Bowl at Yankee Stadium. time in this bowl game. 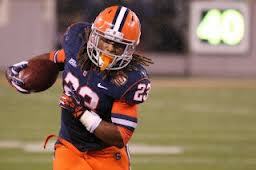 Syracuse took a 36-34 win over Kansas State in 2010. Jerome Smith carried the ball 29 times for 158 yards in the win. Mountaineers (7-6), who lost six of their final eight games of the season.